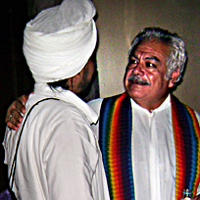 A Muslim cleric and an Ecumenical Catholic Priest exchange ideas at the first Universal Multicultural Dialogue, which took place in Guadalajara, Mexico in 2012. 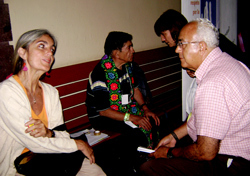 Sande Hart of SARAH chats with Mario Dominguez, representative of Guadalajara's Buddhist community. Organizers of the Multicultural event set aside a quiet place in the former Augustinian convent for participants to steal away from the conferences for a quiet period of meditation. Native communities held dances to purify the museum which, during part of its history, had been a military installation. 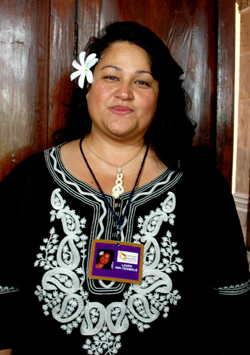 Laura Ava-Tesimale of American Samoa. 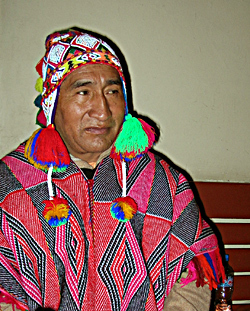 Sebastián, a Quechua priest from Cusco, Peru. Mayas, Huicholes, Rarámuri, Mexicas and other native peoples fully participated in the event. Juan Ruiz Naupari conducts a workshop on Pneuma Breathwork, a kind of Yoga which blends modern and ancient traditions of the East and West. 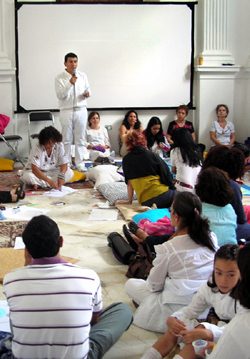 Approximately 100 people participated..
A Universal Multicultural Dialogue took place in Guadalajara, Mexico between August 29 and September 2, 2012. Hundreds people from a dozen countries participated in the five-day event which included workshops, rituals of many religions, panel discussions and conferences by representatives of numerous religions and spiritual movements. The venue of the Dialogue was the Museum of Western Archaeology, housed in a venerable 18th century building which once served as a convent for Augustinian Nuns. The objective of the event was to convene an international forum of people of diverse ways of thinking and belief, regardless of race, creed or social status, who are dedicated to a better world. Here they discussed topics such as: Faith and Globalization; Cultural Identity and Migration; Exploring Respect for Life in terms of Ecology, Human Rights, Childhood and the Wisdom of Elders; the Role of Women; Indigenous Voices; Spirituality Without Religion and other subjects. The Dialogue was organized by Carpe Diem, an association founded in Guadalajara by a mixed group of humanists including an architect, a psychologist, a businessman, a linguist, an Anglican Priest and Jorge Manzano Vargas of ITESO, a Jesuit university in Guadalajara. 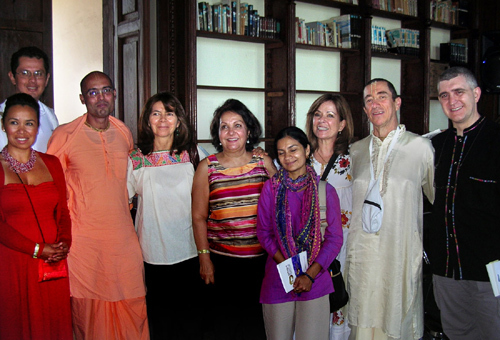 The event brought together representatives of many major religions, allowing them to learn about one another and even participate in the rites and rituals of different Faiths. 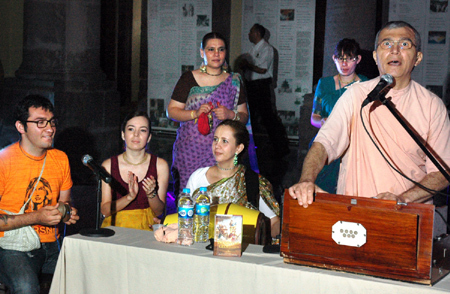 Buddhist participation in the event was thanks to Dr. Mario Domínguez Cross, who directs the Mexican branch of Khamlungpa, a world-wide organization under the Dalai Lama. Dr. Domínguez Cross brought Lama Zoparimpoche and Lama Gueshe Lobsang Khedup to the conference, where they spoke on Mahayana Buddhism, as practiced in Tibet. Lama Khedup also led a meditation session, one of many religious rituals which anyone could attend. Other popular speakers were Alberto Ruz buenfil Coyote, leader of the 13-year Rainbow Caravan for Peace, whose subject was “From Utopia to Ecotopia, One Nation without Borders,” and James Doty, who spoke on Science and Spirituality. He is a Professor of Neurosurgery at the Center for Compassion and Altruism Research and Education (CCARE) supported by the Dalai Lama. Extraordinary in this get-together was the active participation of numerous indigenous groups of Mexico, such as the Mayas, Huicholes, Rarámuri, Mexicas and others. They took advantage of this occasion to remind Mexico and the world that they exist and deserve as much support as any of the other groups present. 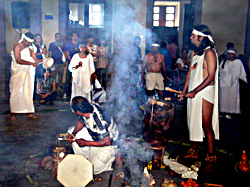 They also conducted a great many of the rites and dances which took place between conference sessions. Carpe Diem hopes to hold a second Universal Multicultural Dialogue in 2014. 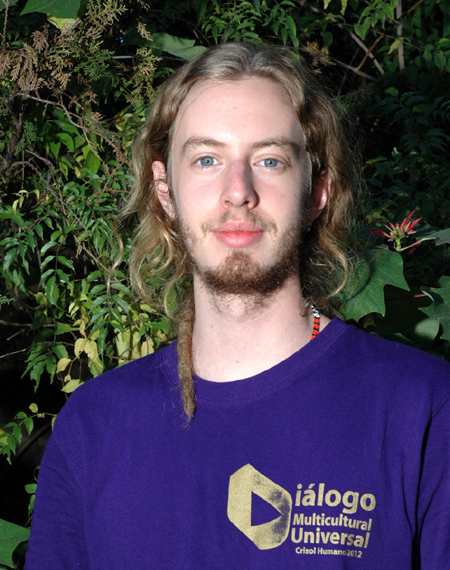 Below: Read the moving reflections of a volunteer at the Dialogue. Ever since I was little I’ve loved reading about religions, cultures, history; how I see myself as syncretic: sometimes I feel I’m too Catholic to be Buddhist, too new age to be Catholic, and too Buddhist to be new age. But I can’t help but wonder, are these three positions really so separate that they can’t co-exist? Day One. The Museum of Archeology of Western Mexico needed cleansing. It seemed like an old tree that had witnessed much, far too much hatred and violence; there was a heaviness, an overwhelming gray atmosphere. When I arrived, I ran into Manuel, my pragmatic meditation teacher, together with a marakame (Huichol shaman) and other people in a line, carrying out a cleansing ritual in the dark, old building. I joined them. If the energy I had felt was dark and old, when I opened channels to carry out the cleansing, a surge of feelings rose up in me: the place had been a seminary, and then a military headquarters. Lord knows what went on in that space, but the energy was clear enough. It was Mexico in miniature: its wounds and sufferings were concentrated there. The atmosphere was suffocating, I couldn’t breathe, and only the strength of all of us together could cleanse and heal something like that. We finished the cleansing ritual and the Multicultural Dialogue began just a few minutes behind schedule. Dancers from the ancient past, purified the stage with divine, ancestral movements, their meaning lost and recovered generations before. Their feathers fluttered through space; hundreds of people had gathered in response to the call to a change of consciousness –fewer than hoped but more than I expected. It was the right number. The sound of the drum ushered in the guests of honor—government officials, representatives of the Parliament of Religions with its headquarters in Chicago, and members of Carpe Diem (a Guadalajara-based, humanistic association) walked up onto the stage one by one to take their places. One of our indigenous sisters, of the Purepecha people, of universal blood and voice, spoke first. She gave permission, expressed her emotion and gratitude, on her own behalf and on behalf of the indigenous of this earth… she gave permission, and then the deluge was on us. The tent was of no use: enormous hailstones tore through the plastic and water flowed freely everywhere. People ran and shouted, and the volunteers jumped into action with a mix of frustration and rapid response as we set about controlling the people and saving the electronic equipment. I spontaneously hugged a friend of mine and laughed, laughed for joy: this wasn’t “bad luck” or cause for frustration. It was the necessary purification. Our cleansing ritual had not been enough: Tláloc himself had intervened to finish the purging of the premises. It was a beautiful spectacle, a display of humility in the midst of so much paraphernalia and superficiality with which we had surrounded ourselves. The message was that this event was to be simple, without so many flashing lights, without so many exterior things. Saturday night. The whole museum came to a halt and the attention of all the participants, speakers and volunteers was concentrated on the central courtyard. It was the blessing ceremony. José Antonio, a great teacher whom I had just met at the event, and I, were in charge of backstage operations. The speakers and representatives of the cultures and traditions took their place on the stage: Sebastián, Ana Tere, Mario, Guadalupe, Susana, Evelia, Jorge, representatives of the Ecumenical Church, the Anglican Church, Pedro Pablo, Andras, Lauro (Peruvian shaman), Muslims, Jews and representatives of the Parliament of the World’s Religions, one by one, in their own spiritual language, gave us their blessing. Drums sounded, holy water was poured on us, the wind and the Peruvians’ bells moved us, the chants of the shamans and the Celts surrounded us, and the wise, poetic words enlightened us. It was at that moment that Jorge told us, “And may your faces always be beautiful and happy.” That’s the way it was and that’s the way it will be, because the energy that came to us in each of the blessings will urge us on for the rest of our lives. Every time I feel I can’t go on; that the struggle for justice, faith, peace and love is blocked and sabotaged by the corruption and suffering of this world; every time my strength flags or quits me entirely, the memory of that night will be with me, when a few gathered in representation of many. We gave everything we had for a common aspiration, the desire to live together, the desire of love. When the time came, Carlos spoke. I can’t remember his exact words, because I was holding a sign with the Golden Rule: “Treat others as you would treat yourself.” I held it high and with pride so that everyone could see it as we listened to Carlos, the director of Carpe Diem and father to us all. The applause was long, the longest I’ve ever heard in my life; people’s hands and arms did not tire; we took our energy from the atmosphere, and everyone standing, with our feelings stuck in our throats ready to make us burst into tears, we applauded without knowing when it would stop. I can still hear the clapping of all those people, dreamers but realists, mystics but activists, peaceful but committed… We were one sound, one song, a mythical melody, a story, a legend. We lived a legend, a legend whose wind will continue to blow and motivate each and every one of us individually in our particular struggles for peace, and it will motivate us as a community to celebrate once again in two years’ time.